You know when people go away to famous tourist destinations and come back going, 'It was OK, but it wasn't that good'. I have not had that experience yet at all! All the places that I've visited so far that are famous as tourist destinations have in my opinion been living up to their reputation. First it was Ha Long Bay and Sapa in Vietnam, now I can add the Temples of Angkor to my list of awesome things I've seen. 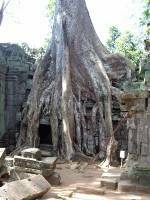 For those who don't know, from about 800 - 1600 (don't quote me on those dates) about 50 temples were built by the ruling Kings of Cambodia. They got more and more impressive as the years went on cumulating with Angkor Wat, which is the largest religious structure in the world (bigger than the Taj Mahal). Bayon: The King who designed this one (Javaraman - or something) had 216 images of his face on all the columns and walls so wherever you stand theres about 8 faces looking down on you! You've gotta appreciate an ego that size. We visited that one at sunrise - very eerie in the morning. Bantey Kdai & Preah Khan - Similar, both a massive jumble of corridors, doorways and piles of rubble. They was one of our first visited on different days, and we were almost alone in both. They would have been great fun to explore in as a kid. 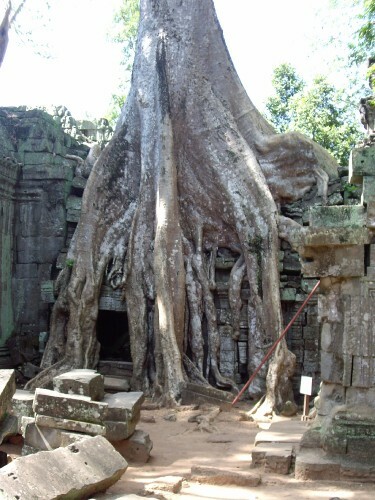 Ta Prohm - Similar to the ones above, but more famous as part of Tomb Raider were filmed here. The tree root systems invading the bricks were impressive. Angkor Wat - Just amazing. Sitting on the top level while the sun sets was sublime. So thats it for me and Cambodia. I have 2 days of travel to hit the Laos border - not sure when I'll next update as I think the first place I'll be hitting doesn't have electricity!